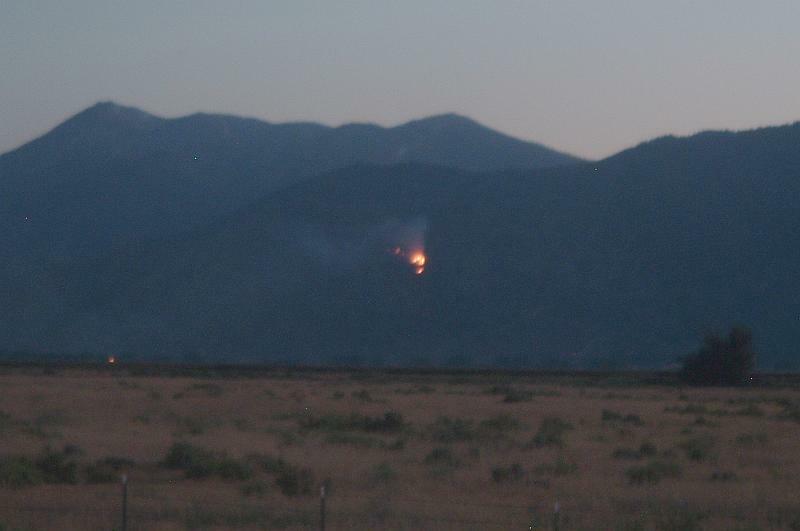 There is currently a wildfire buring on the west slope of the Carson Valley, between Genoa and Walley’s Hot Springs, about halfway up the hill. It’s still pretty small, so it looks like it can’t be more than a few hours old. The Record Courier has a small report on the fire, but this will be one to watch throughout the night, since the fire danger has been extremely high lately. This fire is just a couple of miles away from the Autumn Hills Fire of 1996, which burned nearly 4,000 acres of hillside. The steep slopes and dry conditions can make it tough to fight fires on the Sierra slope, so let’s hope this one behaves and the firefighters are able to beat it into submission. 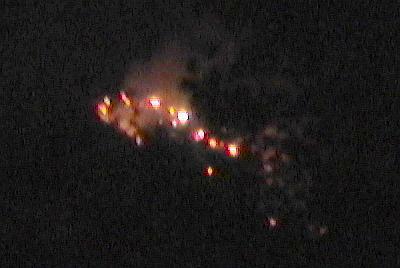 Update: 7/18/05 11:30pm: The fire looks like it’s gotten much bigger over the last few hours. It’s definitely grown beyond the one acre as quoted in the Record Courier. I wish I had better camera equipment, but this fuzzy shot is the best I can do in the darkness. The flames seem to be spreading uphill, and I think it’s pretty impossible to get air tanker support in the middle of the night, so it’s just up to the guys on the ground to fight this thing. I bet morning can’t come soon enough for the crews up there. Update: 7/20/05 12:30pm: It’s out. Job's Peak Fire Christmas Events June is Fire Season Waterfall Fire Fifth Anniversary Fire!! Fire!